Our summer officially ended yesterday since our school system started back today, cutting our summer about three weeks shorter than we are accustomed to. But it is what it is, I suppose. They became eighth and fourth graders today which is just insane seeing as how they were turning eight and four just yesterday. Or at least it feels that way to me. I took them clothes shopping at Concord Mills yesterday. It's about an hour's drive there and it had been quite awhile since we were there last. I almost got a little teary when we passed the Carters and Osh Kosh stores where I used to buy their clothes, back before they cared about brand names and "swag". I pointed the stores out to them and Devin scoffed a little and then said, "I remember that." Now I hesitate to buy them a pack of socks unless they pick them out themselves. We walked into one store that had what I thought were stylish clothes for a kid Dracen's age and he had so much anxiety that he actually told me he was embarrassed to be in there. "This store is for kids! ", he barked. "Um...Hello? News Flash! You're NINE!" Being the little brother by four years is a stressful life position to uphold. That boy has been trying to catch up to his older brother and older friends since the day he took his first step. We took them to Carowinds Amusement Park last Thursday. It was the first time Dracen had been in four years...the last time he was only five years old. He's tall for his age but thin. In his check up a couple of weeks ago, I was told he's in the 75th percentile in height but only 25th in weight which has always been pretty standard for him. We determined the night before Carowinds that he was indeed tall enough, by a hair, to ride every ride in the park. Hearing those words reduced his anxiety level by at least fifty percent and he was all kinds of pumped up. Apparently a little of that excited confidence rubbed off on me because I was feeling so gung ho that I decided to hop in line to ride the Intimidator with them as soon as we walked through the gates. I did not do my research nor did I get a good full look at the thing before I got on it or it would not have ever happened because HOLY SMACK! WHAT WAS I THINKING?! 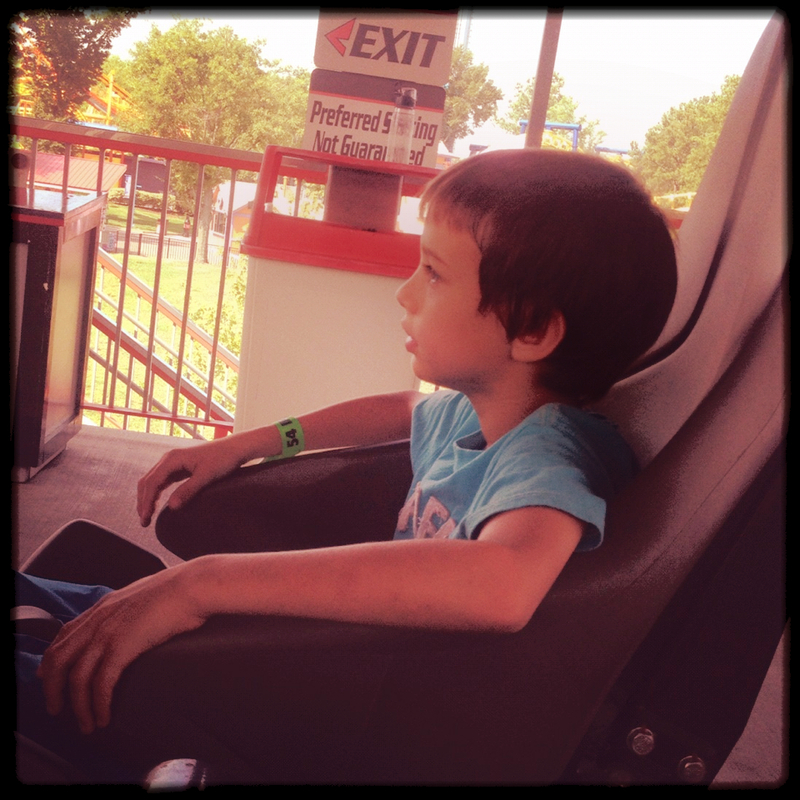 I was a little worried about Dracen because although tall enough to ride, a good strong wind could blow him away. I didn't realize, however, that I should have also been extremely worried about myself. The Zyrtec I took in the car on the way down was probably my first wrong move, with the second being the belief that I could swing an 80 mph roller coaster at my age. I was so naive that I actually thought I'd be able to hold my iPhone up and take pictures during the ride. I knew I was in trouble when the kid working the ride said, "Ma'am, I'm going to need you to put that phone in your pocket." And then we were off. Or I guess I should say up because we.were.going.straight.UP. Looking over at Dracen and seeing the look of sheer terror on his face was just about enough to have me screaming, "STOP! STOP! WE'VE CHANGED OUR MINDS!" Instead I shouted over to Dracen, "Keep your head pressed against the seat! ", which clearly did not go a long way in easing his fears. The first big hill in roller coasters always used to get my tummy so I learned that if I held my breath on the first hill, it helped and I was good for the rest of the ride so I reminded myself to do that. Ha! The coasters I was riding back in the day were not even in the same league with this thing because I took my big deep breath and then as we started descending I was gasping for breath like a goldfish on a tile floor. Then I screamed like I haven't screamed in...maybe ever. And then I was praying and shouting at my poor baby, "PRESS YOUR HEAD BACK! PRESS YOUR HEAD BACK AGAINST THE SEAT!" And it seemed to go on forever and ever and ever. It was, hands down, three and a half of the worst minutes of my life. I remember thinking that this must be kind of what hell is like. It's a thousand wonders I didn't get down on my hands and knees and kiss the ground when that thing finally stopped. But no, although I was shaking like a leaf in a windstorm, I decided to proceed to make mistake number three of the day by riding the Goldrusher. It's an old one... a normal-sized old school coaster and my all-time favorite. But I was ruined. Done for the day. Because even it made me queasy after that traumatic Intimidator experience. It's amazing how fast the time passes, isn't it? I will have a 6th, 4th and kindergartner this year. I have no idea how this happened. I use to be a roller coaster junkie...not so much anymore. Looking at the picture of that ride makes me want to pee myself. My friend took me to an amusement park last week to cheer me up after some bad stuff going on. We rode a TON of coasters. My back is still hurting! Holy crap Im not young anymore! My kids are roller coaster junkies but I'm pickier because the overhead harnesses always hit me right in the ear and it HURTS! It's so true that we just don't handle those rides the same way. I don't remember feeling beat up when I was younger, but now I feel like my head is getting slammed around and it just plain hurts! I do love the hills though, but the rest....not so much! What is it? Why can't we ride those rides, now? I had to ride a few rides with the kids a couple of weeks, ago. I thought I would die! I can't even look at "the swings" anymore. It makes my head swim! And, those old time ones like the "scream machine" make me want to stop off at the chiropractor on the way home. Our parents were awesome for all those Disney, Six Flags, Miracle Strip,etc. Those were the days. My kids LOVE the fast rides. I just can't do them anymore. They are too crazy for me. I do love amusement park food though. I am laughing about the amusement park. I used to be a thrill seeker and rode every ride in the park. Now I won't even contemplate riding. HATE THEM. I think something happens to us as we get older. We actually become fuddy duddies. Love the Goldrusher. Its the fastest one I will get on there. 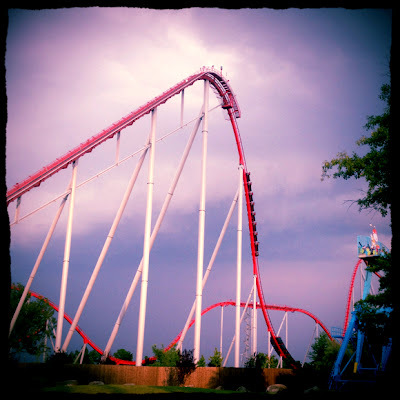 Where did you walk most, Concord Mills Of Carowinds?